Energies of orbitals of hydrogen and hydrogen like particles depend upon the value of principal quantum (n) number only , those of multi-electron atoms depend both upon principal quantum number( n ) as well as azimuthal quantum number(l). Diagram representing the arrangement of orbitals in order of their increasing energies are called energy level diagrams. 1)The sub shell of a particular shell do not have equal energies.For Ex: 2s and 2p have different energies. 2)In a particular shell, sub shell with lower value of l has lower energy. In the second shell, 2s ( l=0) has lower energy than 2p ( l=1) .In the 3rd shell, energies are in the order: 3s < 3p < 3d. In the 4th shells, they are in the order of 4s <4p< 4d< 4f. 3)For the same value of n, the differences between energies of s and p sub shell is small whereas between p and d sub shell, it is large and so on. 4)As the value of n increases ,the sub shell of lower shell may have higher energy than that of a higher shell, 3d has higher energy than 4s. In hydrogen atom, the only force of interaction is the force of attraction between the negatively charged electron and the positively charged nucleus. But in a multi electron atom, in addition to the force of attraction between the electrons and the nucleus, there are forces of repulsion among the electrons. The atom is stable because the net forces of attraction are greater than forces of repulsion.The repulsive forces are on the electrons of the outer shell by the electrons of the inner shell. The attractive forces on the electron increases with increase of the nuclear charge.But these attractive forces on the outer shell electrons are greatly reduced by the presence of inner shell electrons which produce a screening effect or shielding effect between the outer shell electrons and the nucleus. The net positive charge experienced by the electrons is does much less. This is known as effective nuclear charge. Effective nuclear charge experienced by an electron depends upon the shell and the shape of the orbital in which that electron is present. 1)s orbital ,being spherical in shape, shields the electrons from the nucleus more effectively then p orbital which in turn shields more effectively then d orbital. 2)Within the same shell, s – orbital are more attracted to the nucleus and hence have lower energy than d orbital which in turn are more attracted to the nucleus and hence have lower energy than the d orbital. The energies of the orbitals depend both on the values of n and l.
3)As effective nuclear charge depends upon the actual nuclear charge, similar orbitals of different atoms do not have the same energy. These decrease with increase in nuclear charge. In the ground state of the atoms ,the orbitals are filled in order of their increasing energies. Electrons first occupy the lowest energy orbital available to them and enter into higher energy orbitals only when the lower energy orbitals are filled. The energy of an orbital depends upon the sum of the values of principal quantum number( n ) and azimuthal quantum number. This is called (n + l) rule. In neutral isolated atom ,the lower the value of ( n + l) for an orbital, lower is its energy. However, if the two different types of orbital have the same value of ( n+ l) ,the orbital with lower value of n has lower energy. An orbital can have maximum 2 electrons and these must have opposite spins. The two electrons have opposite spins i.e. 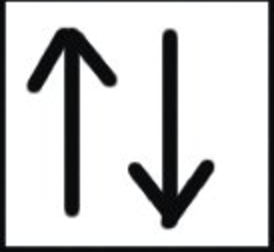 if one is revolving clockwise, the other is revolving anticlockwise. Electron pairing in p, d and f orbital cannot occur until each orbital of a given sub shell contains one electron or is singly occupied. 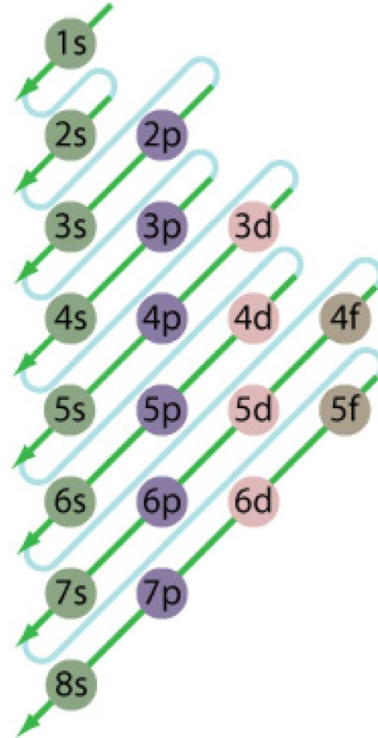 Electrons being identical in charge, repel each other when present in the same orbital. This repulsion can be minimised if two electrons move as far apart as possible by occupying different degenerate orbitals. All the singly occupied orbitals will have parallel spin i.e. in the same direction either clockwise or anticlockwise. This is due to the fact that two electrons with parallel spin will encounter less into electronic repulsion in space than when they have opposite spins.